Record-breaking hopefuls The Bloodhound Team is delighted to announce the successful sale of the business and assets, which allow the project to continue. It had seemed that the jet-powered car was destined never to turn a wheel after the project fell into administration in September, following numerous missed deadlines. The project has been bought by Yorkshire-based entrepreneur Ian Warhurst. A mechanical engineer by training and long term Bloodhound enthusiast, Warhurst has a strong background in managing highly successful businesses in the automotive engineering sector. He will bring considerable expertise to bear in taking the project forward. 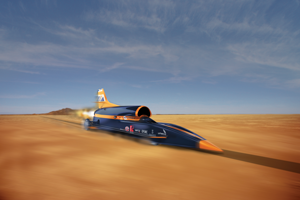 A statement on the website says: “The Team are thrilled that Ian has saved Bloodhound SSC SSC for the country. Its the best possible Christmas present for the many supporters around the world who have been inspired by the project”.